Great strategy title. Build your own castle, create a powerful army and fight epic player versus player battles. Become the lord of a castle and turn your small fortress into the capital of the entire kingdom in this exciting online strategy game. Establish an efficient economic system and assemble a mighty army to defend your realm and extend your territory. Forge alliances with other players worldwide to crush your enemies, and become the sole ruler of a mighty empire! Build your own castle, create a powerful army and fight epic player versus player battles on a dynamic world map. Crush your enemies, conquer land and rise to the ruler of a mighty empire in this free game! 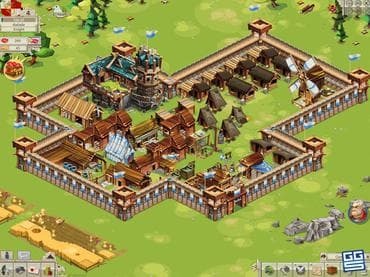 Free Game features: - An army comprising different melee and ranged fighters; - Combat against other players and an alliance system; - A dynamic world map; - Strategic battles using various units and siege tools; - The ability to upgrade your castle with numerous buildings; - An economic system with different resources; - Outposts for securing more supplies; - Entertaining campaigns with missions and attractive rewards. If you have questions about Empire: Four Kingdoms game, please contact us using this form.